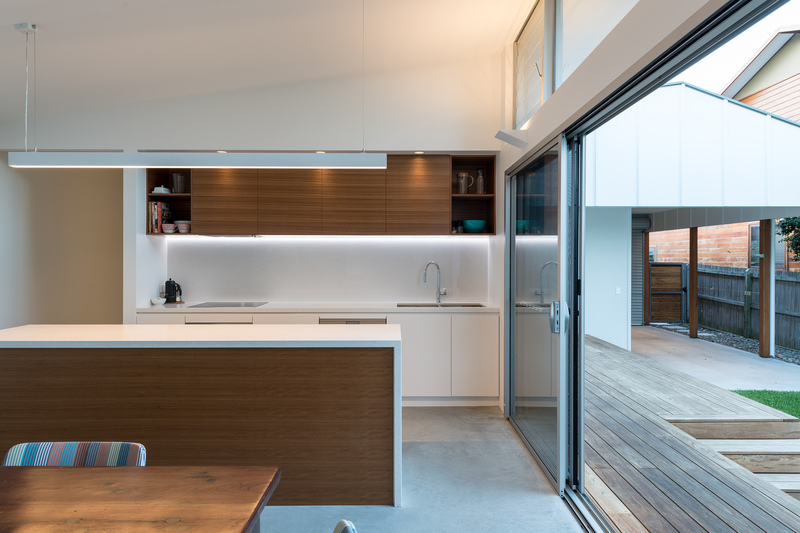 A Modern Take on the Traditional Fibro Beach Shack - BuildHer Collective. “Blueys Beach is a popular holiday destination, on the Mid North Coast of New South Wales, Australia. 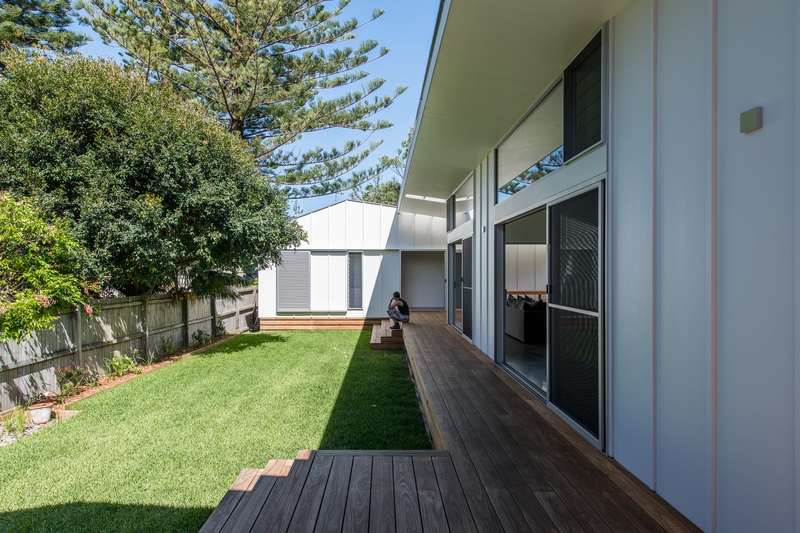 The original houses in this coastal village are simple fibro or weatherboard structures. 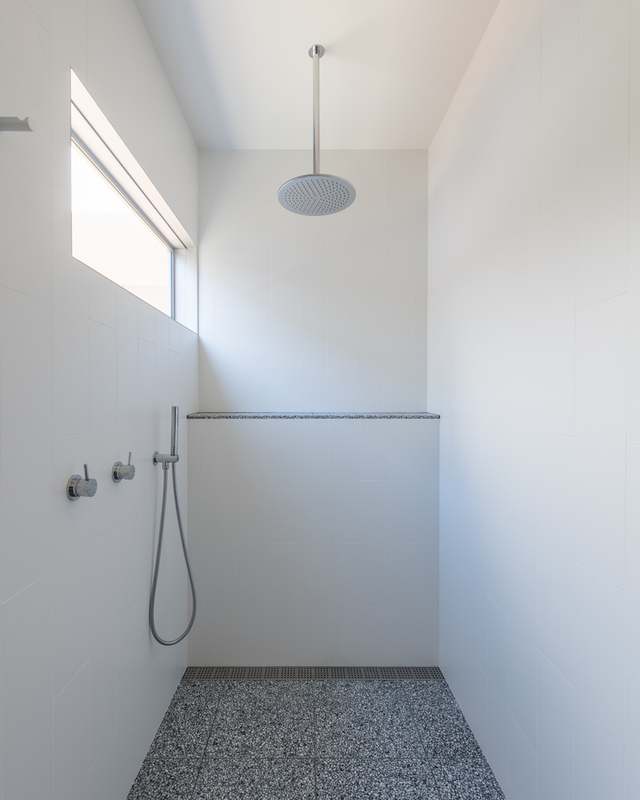 They are weather-beaten and basic, yet they generally offer a relaxing beach holiday experience. 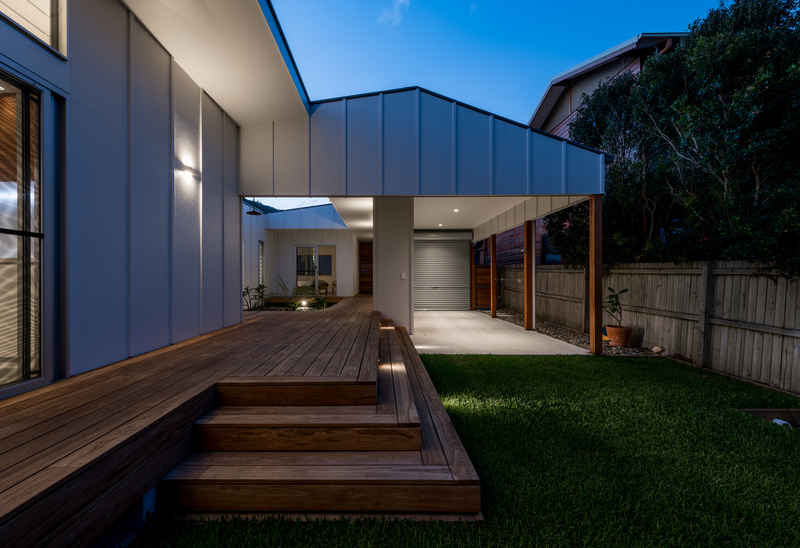 Unfortunately, when properties change hands, original buildings are often replaced by large suburban houses, which have little recognition of place and relate poorly to the immediate context”, explain Bourne Blue Architecture. 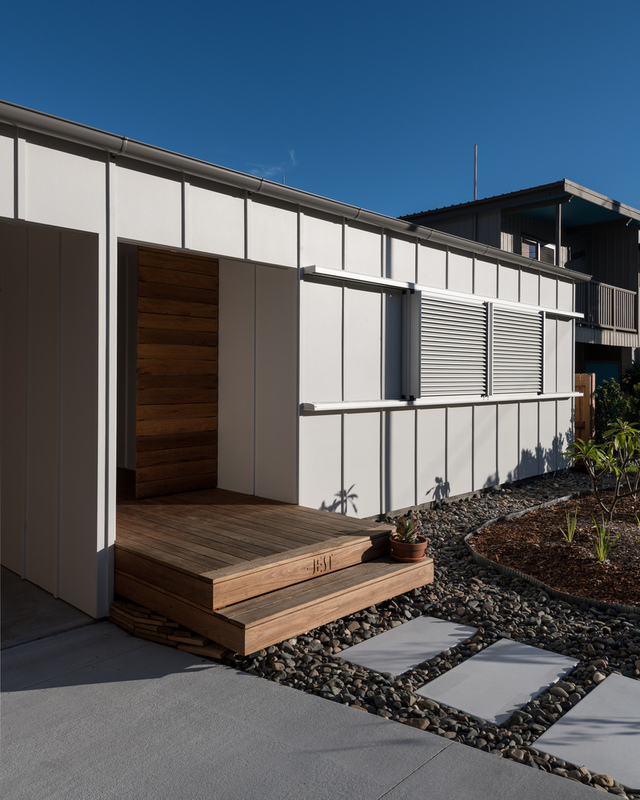 Designed for an empty, but narrow block (just 12 metres wide), Blueys Beach House 5 is designed as a simple, but comfortable holiday house. 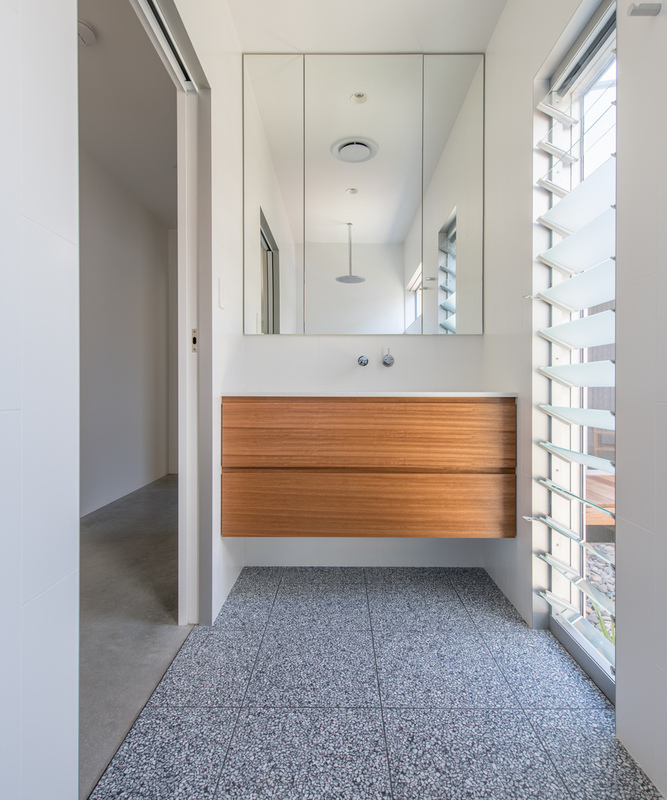 With existing homes on the neighbouring blocks, the beach house is built in an L-shape along the southern boundary to create a private north-facing outdoor space. 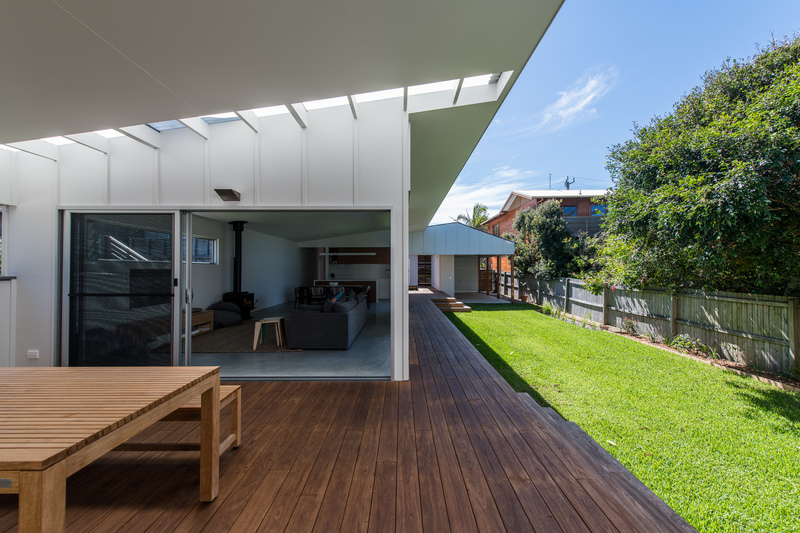 A covered deck and courtyard create a number of functional outdoor spaces for laid-back outdoor living. 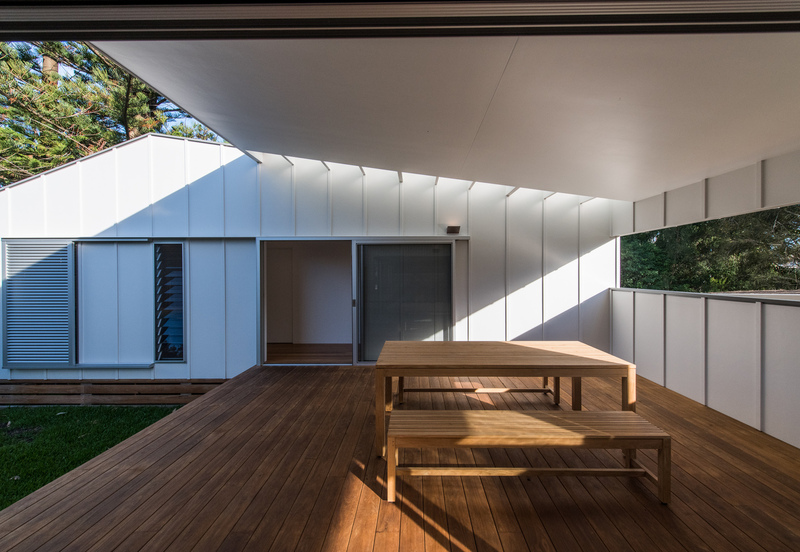 The roof of the deck has slits covered with translucent fibreglass roofing which lets light in, giving it a more outdoor feel. 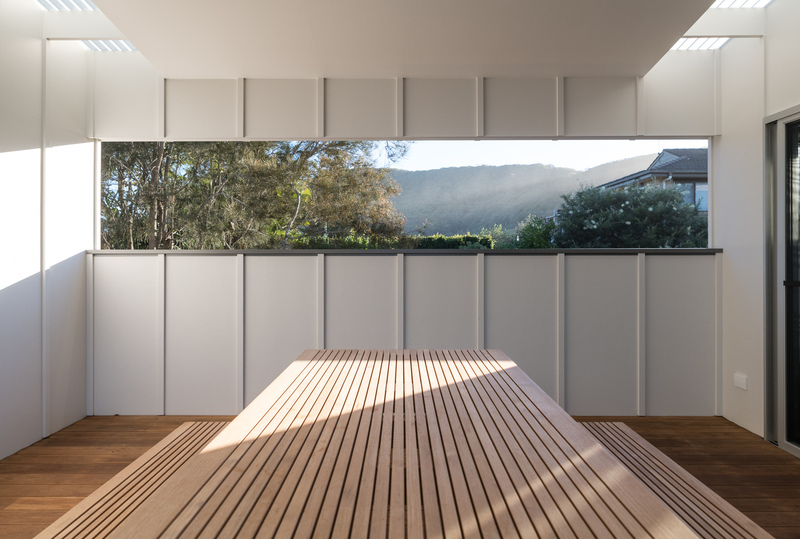 A long slit opening in the south wall of the deck is carefully placed to take in views of the nearby hills, without overlooking the neighbours. 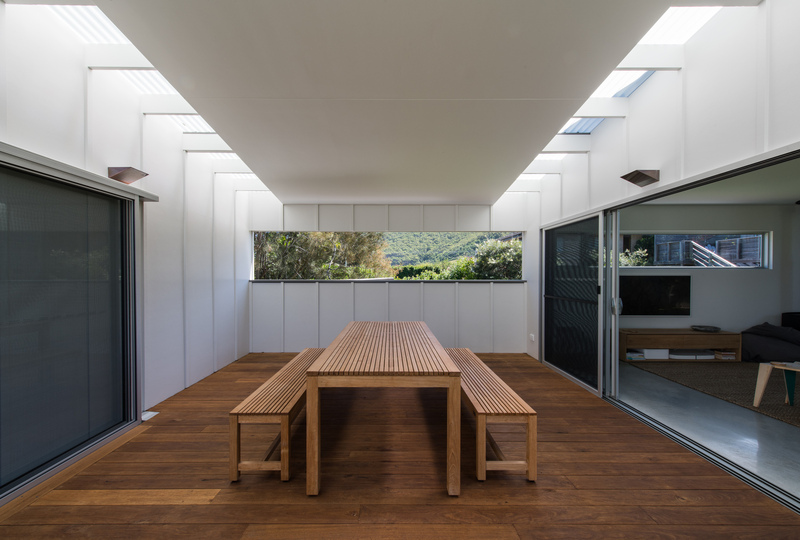 The outdoor deck stretching the entire length of the house creates an easy transition from the beach to the indoors and creates an effortless indoor-outdoor connection. 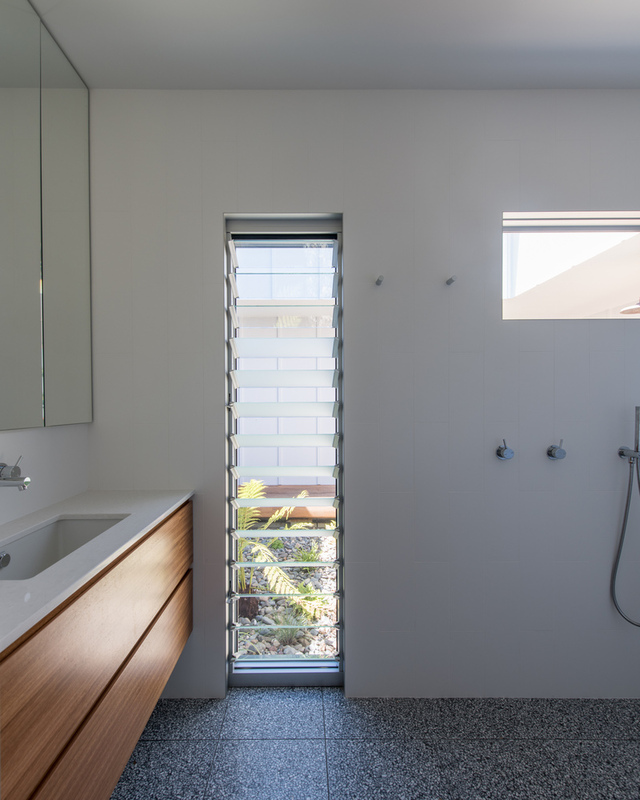 An outdoor shower with direct access to the laundry keeps the home sand-free. 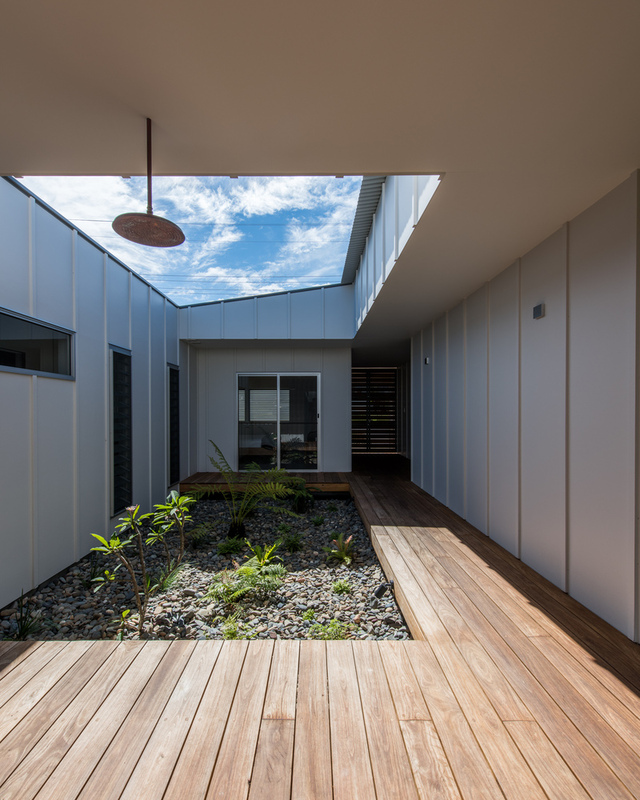 A void in the roof over this courtyard space lets light in to grow plants which will eventually provide privacy for the bathroom. 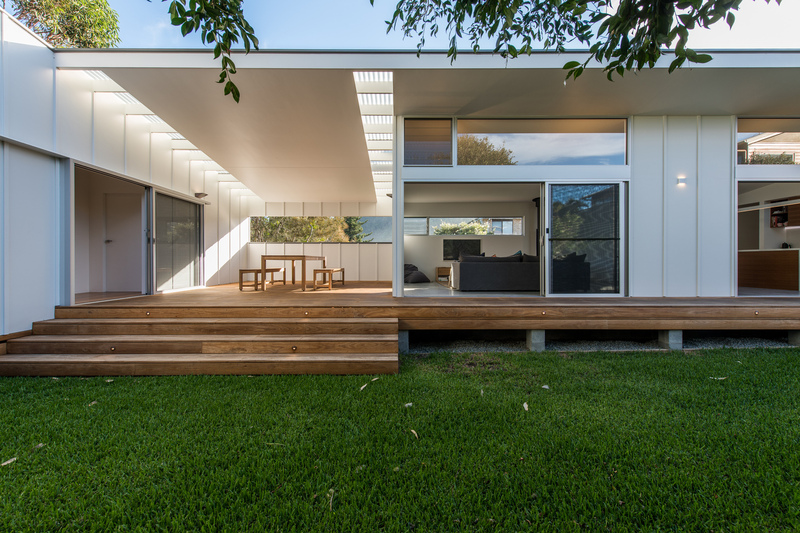 The home is far from ostentatious, slung low on its block compared with its two-storey neighbours, with a low roof sloping towards the boundaries. 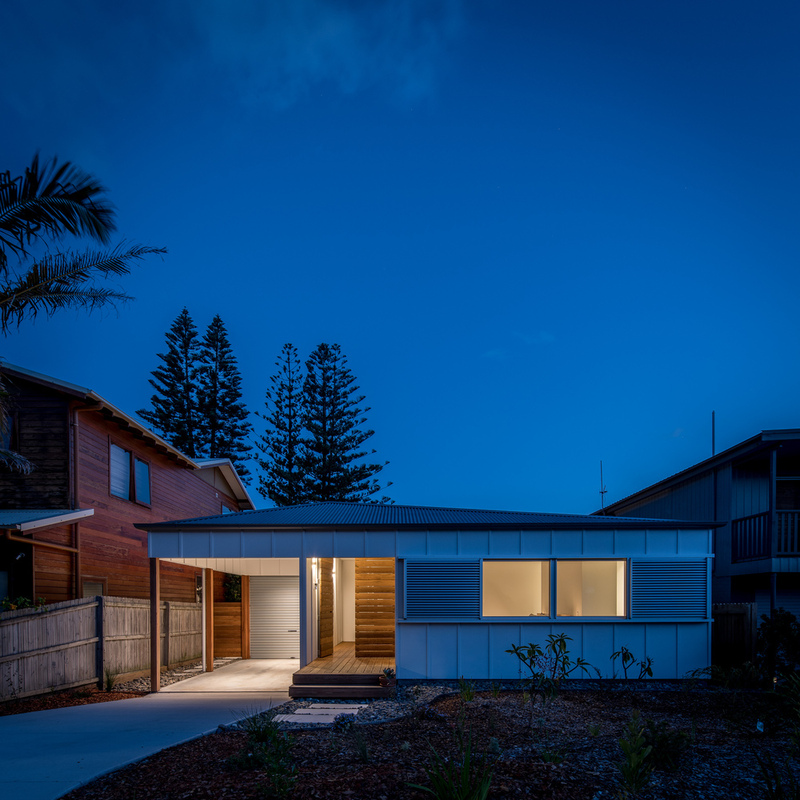 Built from the same fibre cement as the traditional beach shacks in the area, it feels right at home. 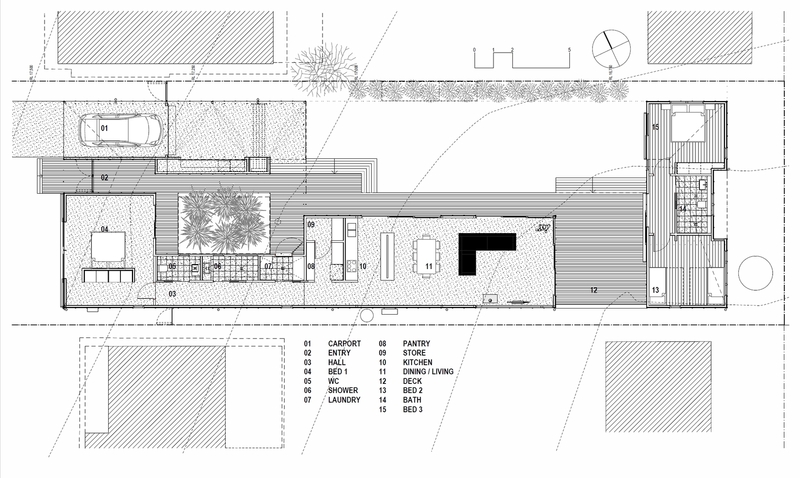 The garage is a simple carport which can be repurposed for hammocks or ball games. 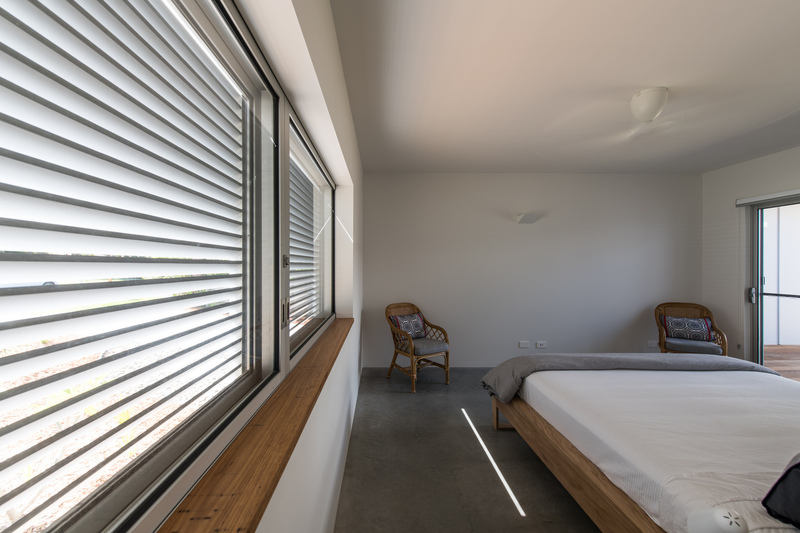 A bedroom wing is separated from the rest of the house by the covered deck, constantly drawing the owners into the outdoors to enjoy the fresh sea air. 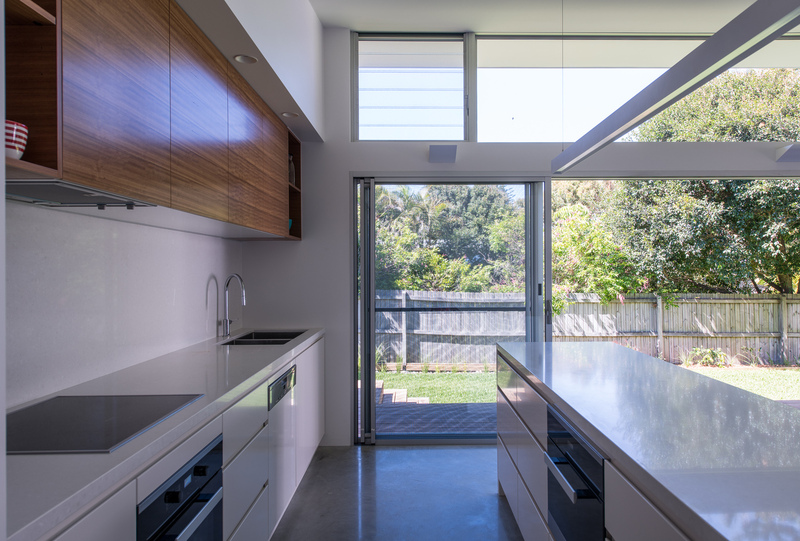 This also helps to zone the house for when fewer people are occupying. 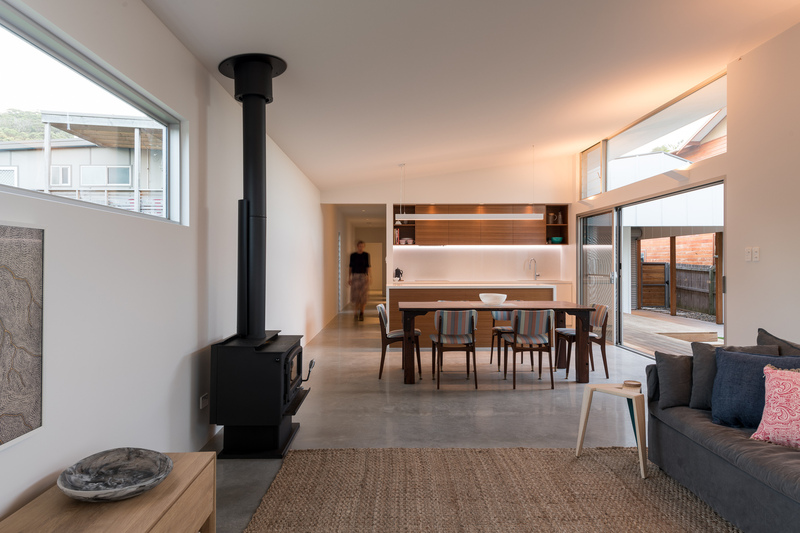 Designed with passive heating and cooling in mind, polished concrete floors are placed to absorb warming winter sun and are shaded in summer, while the house is well-insulated to maintain a comfortable temperature. 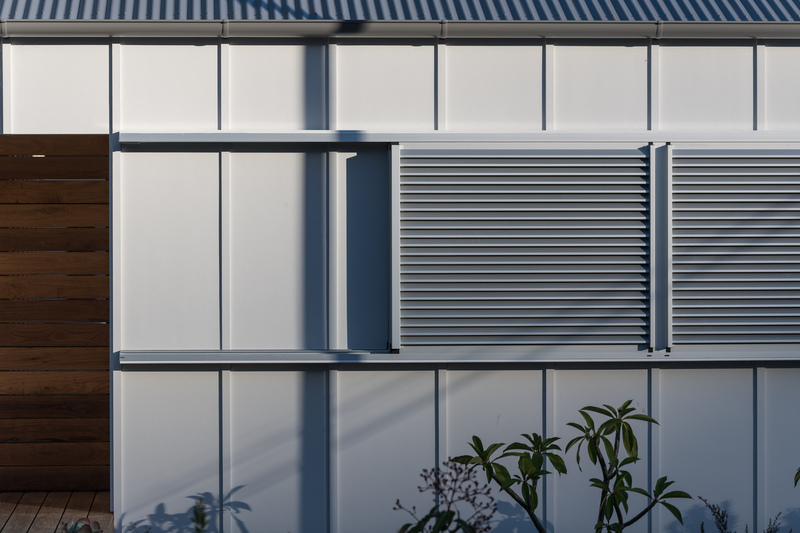 Rainwater is collected for the toilet, laundry and garden while a heat pump in an energy efficient hot-water heating solution. 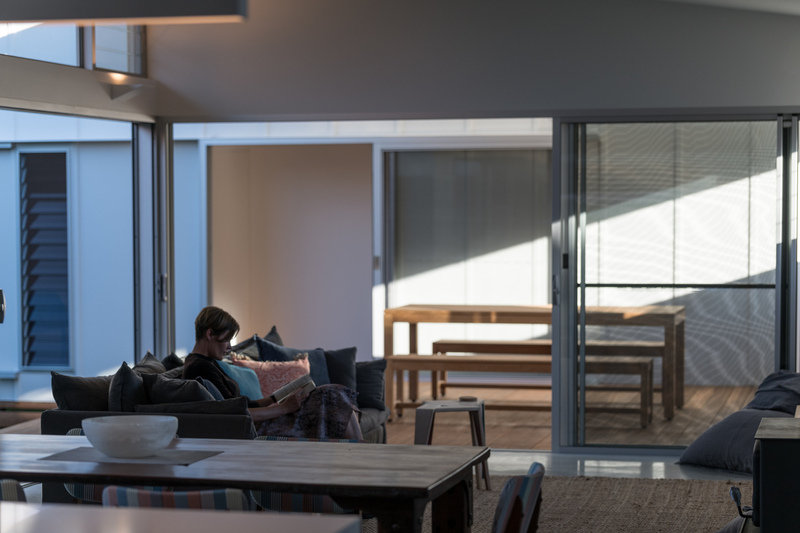 This is a simple, yet functional holiday home which maximises outdoor time and creates a laid-back lifestyle for beachside living. 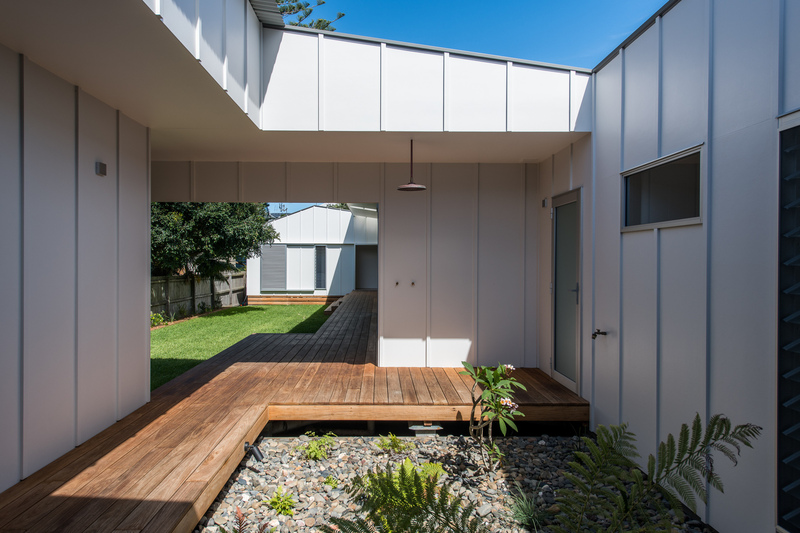 The large suburban-style homes which are slowly replacing traditional beach shacks can’t offer this experience. Instead, they are inward looking and poorly connected to the outdoors. 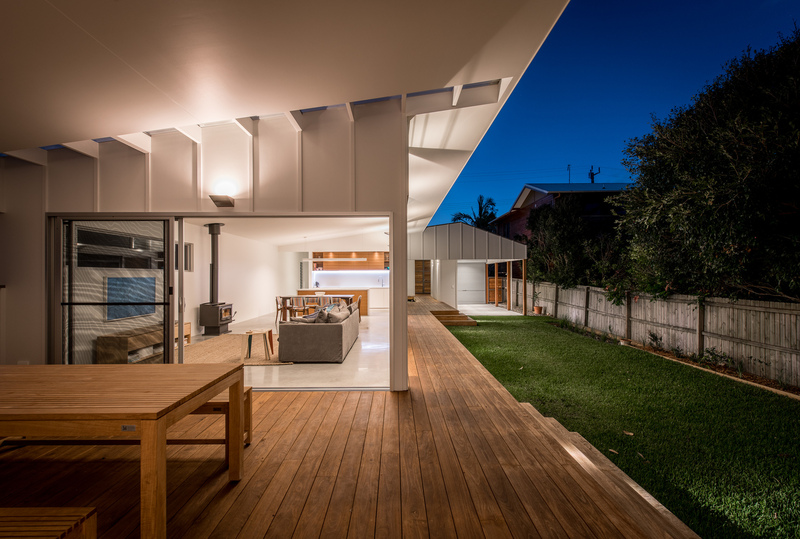 More beach houses like this one will offer a much better experience of the beauty and uniqueness of seaside towns.